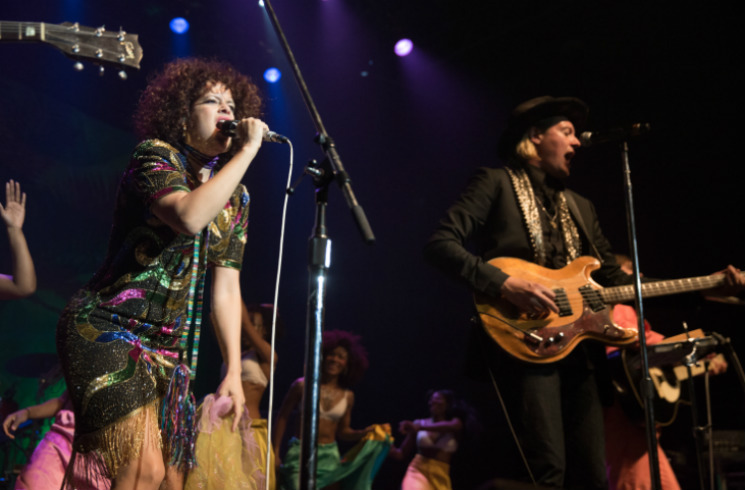 Arcade Fire's yearly KANPE Kanaval benefit concert rolled through Montreal Wednesday night (March 15) in support of Regine Chassagne's KANPE Foundation. With all proceeds going towards furthering the financial autonomy of Haitian communities, the evening was both a celebration of Haitian culture and an investment in the country's future. In practice, though, the evening was a kaleidoscopic Kanaval where backgrounds and art forms mixed together in one deliriously delicious stew. Early evening performers Fwonte and Tito Marechal mixed rap and blues with Haitian Creole, creating new combinations that were as cutting-edge as they were danceable. Even more impressive was Pierre Kwenders, whose borderless sound blended pop, hip-hop, African music and what felt like at least 20 other genres and nationalities without losing even a smidge of his boyish charisma. In between sets, drummers and dancers scythed their way through the crowd, forming impromptu pockets of dancing and good cheer wherever they went. At times the Kanaval felt less like a rock concert and more like a street party where the audience were just as much participants as the performers. Perhaps it was this environment that made austere singer-songwriter Coeur de Pirate's performance ring just a little bit false against the colours and sounds of what came before. But credit to Béatrice Martin — she did begin to capture a somewhat sombre undercurrent to the evening's vibrant festivities. In 2017, celebrating diversity and multiculturalism feels more vital than ever, as these very values are under serious threat both at home and abroad. Fittingly then, Arcade Fire chose to open their set with their first performance of "Windowsill" since 2008, a piercing ballad about the rising, suffocating tide of virulent politics. From there, the band pivoted to fan favourite "Haiti" before packing the rest of set with some of their biggest hits. And nobody does effervescence like Arcade Fire. Limited to around 30 minutes of set time, the band were at their leanest and meanest; from the transcendent disco of "Sprawl II" to the driving rhythm of "Rebellion (Lies)" they all but levitated. That's not even mentioning "Wake Up," a lighting-in-a-bottle closer that still makes a mid-size rock club feel like an arena, even ten years and countless performances after its release. By the time the song's last notes rang out and Kwenders and Win Butler descended to the decks to fuel yet more dancing and revelry, it was already apparent that this was yet another Kanaval for the ages. It felt needed. Order Arcade Fire's most recent album, 2013's Reflektor, on CD and vinyl via Umusic.